Children in Mahalla, Cairo, role-playing the ISIS and “slaughter” other children ISIS-style. Still from a video shared by @Shokeir on Twitter. Faces in the still blurred by Global Voices. 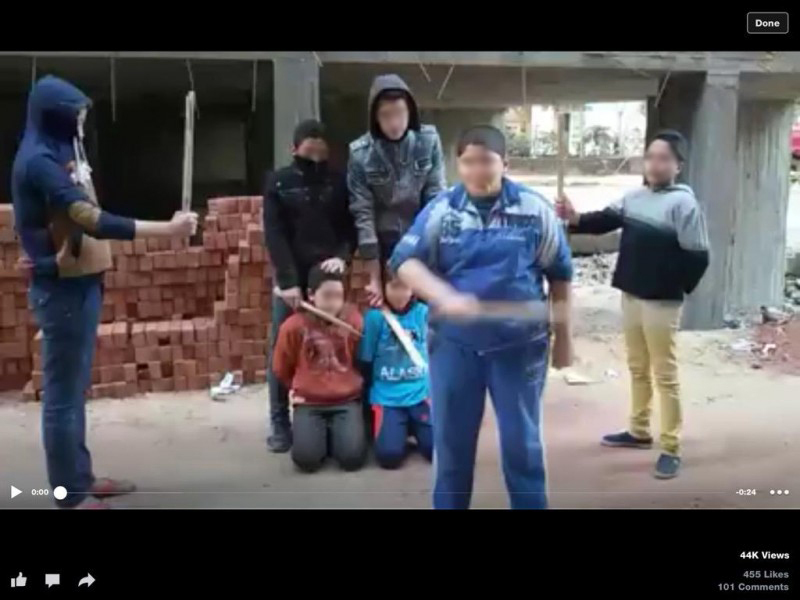 Children from Egypt's El Mahalla El Kubra have been video-taped “slaughtering” other children ISIS-style while playing with wooden sticks. The video raises more questions than answers on the “merits” of sharing horrific videos detailing the terror group's crimes, particularly with children. The Al Qaeda off-shoot ISIS, which has come to control larges swathes of land in Iraq and Syria, has taken great pride in releasing highly-produced videos, showcasing how they behead their captives. Despite a cat and mouse chase to remove their graphic propaganda online, many continue to share the videos, unconcerned by the damage they could cause to viewers. This El Mahalla El Kubra video may have been made after the militant group “ISIS in Libya” beheaded 21 Egyptian Coptic Christian workers who had been abducted in Libya more than a month ago. On February 15, the terrorists posted a gruesome and bloody video on YouTube that showed the beheading of the hostages, creating an uproar in Egypt, including the bombing of ISIS sites in Libya. El Mahalla Al Kubra is an industrial and agricultural city in Egypt, located in the middle of the Nile Delta on the western bank of the Damietta branch, and is home to about half a million people. This tweet has been retweeted 150 times and counting. Post by Tamer Abdo Amin. We have no religion or nation. We slaughter children, women and the elderly. We have decided the following: to kill all the youth of the town of (inaudible). Slaughter then Oh men! There was a time when kids in Egypt, like kids everywhere, played cops and robbers. And the cops would win. And it made me smile. Natural order of things, I'd think. Then after 2011 I've seen kids play cops and protesters. And one cop would ‘kill’ (well, you know, pew pew pew) one of the protesters, who would then revolt, and chase after the cop-kids. And it made me smile – because it was funny, but it was no less sad, because kids shouldn't have to contemplate the mere thought of police brutality. Tonight I saw this video, of kids playing Daesh, where first kid gives a little speech (incidentally in better Arabic that the minister of foreign affairs, but i digress) and then gives the order to his acolytes to slaughter the two ‘hostages’. And that's not a game that has a happy ending in any possible way. Nobody wins. This is the saddest thing I've seen in a long, long time. Surely watching graphic videos showcasing ISIS crimes leave a dent on adults, but what do they really do to our children? Should children even watch ISIS crimes shared on video? From what the kid said, it sounds like this might have been a protest against ISIS rather than admiration. If that is the case, this is a victory for humanity, not the opposite. As for your question. It likely depends on the kid, their age and their level of maturity. Then again, I am an adult and I won’t watch the videos, I don’t think it is good for my mental health, or respectful to the poor people being butchered. Do not watch it!!!! It is traumatizing! Muslims have to follow the example of Muhammed. Apparently you have no idea what you’re talking about. Are they killing and bombing in the name of Buddha. Or am I confusing their religion?